KTM has been constantly gaining share in the Indian market with the help of the Duke 200 and recently with the Duke 390. Both bikes offer immense value for money with the latter being more VFM than the former. Both these are naked streetfighters, there is a whole breed of people in India who like fully faired bikes and KTM will launch two faired bikes in 2014 in India. The company has not revealed as to which bikes will these be based on but our best guess is that these will be based on the Duke 200 and Duke 390. The bikes are expected to be christened as RC 200 and RC 390. The company also plans on launching a bike between the 200cc and 390cc segment so it might launch a 250-300cc bike as well in faired guise, thus posing direct threat to the Honda CBR 250R and the Ninja 300R. “Bajaj-KTM will launch two variants of the RC brand of faired racing bikes in the calendar year 2014 under the sub-500 cc category,” said Mr. Amit Nandi, Head, KTM India during the launch event of the 390 Duke. The EICMA 2013 which will be held in November might be when the said bikes might be showcased or launched. The engines on these bikes will be the same as the ones used on their streetfighter cousins, but tuned differently. 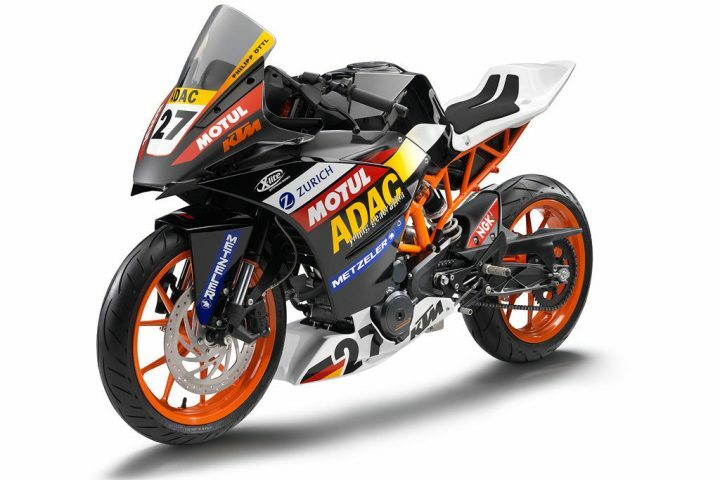 KTM had recently showcased the race-spec RC 390 which will be used in the ADAC junior cup and the production model is expected to be based on it. Expect the faired counterparts to cost Rs 15,000-20,000 more than the naked siblings, but that superbike feeling you get riding on a fully faired bike is priceless. So yes, you should seriously look out for the faired bikes which KTM is expected to launch in 2014.